The discovery of Cherchen Man, along with dozens of other perfectly preserved mummies found in Turkestan in western China, has made archaeologists question the old perceptions of prehistoric cultural exchange. 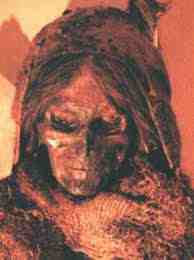 Although the mummies have been known to exist for decades, no one paid them much attention until 1987 when Victor Mair, professor of Chinese studies at the University of Pennsylvania, began to take interest in them following a visit to an obscure museum in the town of Ürümchi (also spelled Ürümqi). So what were westerners doing in China 3,000 years ago and just how much did they influence Chinese culture. 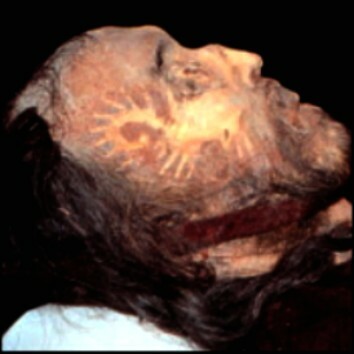 Cherchen Man, a 6ft tall Caucasian man was found in a tomb along with three women and a baby in 1978. Their presence raised several important questions such as: What was their lineage, How had they died and more importantly: What were they doing there. The material, along with other clues such as wheat which was found in other associated tombs, in an area where wheat is not indigenous to the region — was clear evidence that Cherchen Man was a product of Europe. So, too, were less well-preserved mummies of others found throughout the area, some of whom had died 1,000 years earlier. In the 1980's, hundreds of other perfectly preserved 3,000-4,000 year-old mummies began appearing in the remote Taklamakan desert (which sits on the renowned 'Silk route'). They had long reddish-blond hair, European features and didn't appear to be the ancestors of modern-day Chinese people . "From around 1,800 BC, the earliest mummies in the Tarim Basin were exclusively Caucausoid, or Europoid," said Professor Victor Mair of Pennsylvania University. Altogether there are 400 mummies in various degrees of desiccation and decomposition, including the prominent Han Chinese warrior Zhang Xiong and other Uighur mummies, and thousands of skulls. (3) Their discovery has raised several questions over our understanding of events in the region, particularly in relation to the cultural development of China and our concept of cultural exchange in prehistoric times. Even older than the Cherchen find is that of the 4,000-year-old Loulan Beauty, who has long flowing fair hair and is one of a number of mummies discovered near the town of Loulan. One of these mummies was an eight-year-old child wrapped in a piece of patterned wool cloth, closed with bone pegs. The Loulan Beauty's features are Nordic. She was 45 when she died, and was buried with a basket of food for the next life, including domesticated wheat, combs and a feather. Yingpan Man, a nearly perfectly preserved 2,000-year-old Caucasoid mummy, discovered in 1995 in the region that bears his name, has been seen as the best preserved of all the undisturbed mummies that have so far been found. His nearly 2.00 meter (six-foot, six-inch) long body is the tallest of all the mummies found so far and the clothes and artefacts discovered in the surrounding tombs suggest the highest level of Caucasoid civilization in the ancient Tarim Basin region.